Unfortunately, annoying buzzing and itchy bites are not the only things that make mosquitoes an unwelcome visitor. The more than 3,000 mosquito species are responsible for transporting some of humanity’s greatest diseases. Malaria is carried by the Anopheles mosquito and is reported to infect between 300 and 500 million people yearly, causing over 600,000 deaths. The Culex mosquito carries the West Nile virus, filariasis, and encephalitis. The Aedes mosquito carries yellow fever, dengue, and encephalitis. Believe it or not, mosquitoes tend to be picky about their victims. Apparently, not everyone is equally tasty. In one study it was found that mosquitoes land on people who have type O blood twice as often as they landed on people with Type A blood. Have you ever wondered why mosquitoes love backyard barbeques as much as you? If you drink just one 12 ounce beer you become like an instant mosquito magnet. Although researchers are not quite sure why people who drink beer become desirable to mosquitoes, they still seem to show up whenever a glass is poured. A number of studies have shown that pregnant women are bitten twice as much as non-pregnant women. This might be due to the fact that pregnant women exhale almost 21 percent more carbon dioxide and are also warmer than people who aren’t pregnant. Mosquitoes are attracted to certain clothing colors more than others including black, dark blue and red. Wearing light-colored clothing will help protect you from a nasty bite. In addition, wear loose fitting clothing that covers more of your skin so that mosquitoes can’t find an exposed part. Mosquitoes are an inevitable part of warm season months but this doesn’t have to mean an end to your summer fun. The good news is that there are several, non-toxic ways to make your favorite places in your yard and garden repulsive to mosquitoes. One way to protect your outdoor gatherings from unwanted guests (mosquitoes, not your mother-in-law) is to surround your outdoor living space with plants that mosquitoes don’t like. Not only will the plants add aesthetic value to your landscape, but they will also do double duty as a natural defense screen. 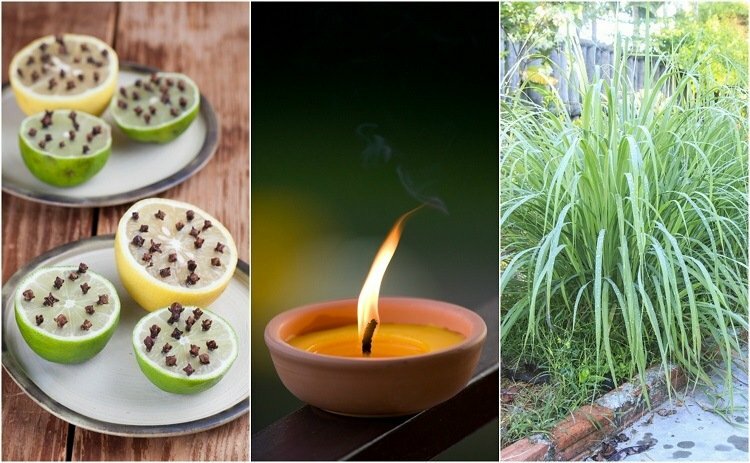 Mosquitoes are going to steer clear of any outdoor party where you are burning incense. For starters, mosquitoes are not big fans of smoke and hate aromatic smoke even more. The most effective incense sticks contain a variety of ingredients including citronella, eucalyptus, and even cloves. Look for incense products that are 100% natural such as these from Amazon. I love coffee and have a lot of used grounds. To keep mosquitoes from multiplying I scatter used coffee grounds in areas of standing water (if I can’t get rid of the standing water altogether). The mosquito eggs are drawn to the surface of the water and deprived of oxygen by the grounds – thus, they don’t hatch! I have always burned pinon wood in my outdoor fire pits. This wood is highly aromatic and will keep mosquitoes well away from your outdoor spaces and home. I let the embers in my fires smolder for a very long time to reap all of the benefits. Try it for yourself with this pinon firewood. When I have an outdoor gathering in the summer I always run a couple of oscillating fans on my patio or porch. Not only does this keep my guests cool and comfortable, but it also blows away mosquitoes. Bats love mosquitoes and the more bats you can attract to your yard, the fewer mosquitoes you will have. Put up bat houses throughout your yard and sit back and watch them gobble up the pesky critters at dusk. It’s not just bats that love mosquitoes, many species of birds including purple martins, swallows and some migratory songbirds devour adult mosquitoes and also eat mosquito larvae. To encourage these birds, hang a variety of bird feeders, suet feeders and create a welcoming bird environment. Dragonflies and fish are also hardy mosquito eaters. Contrary to what you might think about water – a pond with an aerator or fountain and fish will draw dragonflies (AKA mosquito hawks). Swimming, hiking, riding your bike… mosquitoes always have a way of finding you when you are having fun. To make yourself less desirable to these bloodsucking mini monsters, try a few of these tried and true home tactics. Mosquitoes are particularly fond of most lotions, hairspray, perfume and even deodorant. If you do use lotions etc.. try using those that have a strong lavender, basil, rosemary or even eucalyptus scent. If you consume a good amount of garlic before heading outside you may be in luck. Garlic breath may not do anything for your personal relationships, but it will mask the smell of carbon dioxide when you exhale. In addition, the sulfur compounds emitted through your skin will also make you less desirable. If you are an avid banana eater, you might want to pause that for the summer months. When your body metabolizes the banana the scent comes out on your skin and… mosquitoes love bananas. If you are planning a hike or an outdoor adventure, choose clothes that will not make you a mosquito magnet. Light colors and light and loose fabrics work best – as mentioned above. A light-colored hat is also a good idea to keep mosquitoes off your face and head. People are more likely to be bitten if they have a B deficiency. Studies show that taking plenty of B1, in particular, can keep mosquitoes away. Apparently, when you take a little more vitamin B than your body needs, it can cause the excess to be sweated out through your skin. Female mosquitoes find this odor repulsive. Eat foods rich in vitamin B1, such as beef, liver, nuts, oats, oranges, pork, eggs, seeds, legumes and peas or take a vitamin B1 supplement. I had a friend who owned a pot belly big and always brought her on walks. It seemed that whenever the pig was around I got far fewer mosquito bites. Turns out that it isn’t all in my head, pigs have a higher body temperature and mosquitoes will gravitate towards them first before biting you. Vanilla is a natural mosquito repellent. Add two teaspoons of vanilla to one cup of water and put into a spritz bottle. When you are outside hiking, biking or just enjoying some fresh air, spritz yourself with vanilla. The vanilla will mask your body odor and keep mosquitoes away. Clove bud oil has a warm and slightly fruity aroma but don’t let its sweet fragrance fool you, it is a powerful mosquito deterrent. In fact, one study found that just 5% of clove bud oil had a complete 100% repent action against mites – this a very promising indication of what it can do to protect you from mosquitoes. Everyone is familiar with the fresh and sweet aroma of peppermint. While it is very pleasing to us, mosquitoes are not so fond of it. Peppermint is actually a hybrid mint between spearmint and watermint and its oil is very pungent. Besides soothing muscles, and inducing a calm and relaxed state, peppermint can also aid digestive woes and ease a headache. My favorite way to use peppermint as a mosquito repellent is to mix in a few drops of pure peppermint oil in water and place in a spray bottle. I spray my window screens in the morning and evening and this deters the pesky critters from finding their way into my home. As a bonus, my home smells fresh and sweet all day long. Geranium oil is another highly versatile oil that was once used widely in beauty applications in ancient Greece. It is known for its ability to calm nerves and promote healthy skin and hair. The powerful components in this oil also make it an effective insect deterrent. This is due to one of its primary components, citronellol. To keep mosquitoes from biting my head and neck, I add a few drops of Plant Therapy geranium oil to my shampoo. I use this spray inside and out to keep insects away. I love the light feel and fragrance of this lotion. I use it mostly when I am out in my garden. I love using this spray on my countertops and outdoor tables. It cleans and disinfects while acting as an insect deterrent. Bonus: Try making our herbal mosquito repellent spray. Many readers have tried it already and loved it.